Credit card bills can become a burden on your finances and family. Whether a lawsuit has been filed or your account has been turned over to a collection company, credit card bills can cause the most reasonable person to be contacted by a debt collector. Although bankruptcy can discharge some credit card, there are options to look at before filing a bankruptcy. 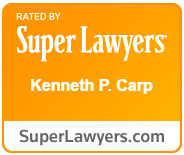 At the Law Office of Kenneth P. Carp, we understand the fears and worries associated with overwhelming debt from credit card bills and work diligently to offer relief to clients throughout the St. Louis area, our attorney provides detailed representation to help you end your financial stress. There are a number of things you can do when your credit card bills are causing a problem for you before a lawsuit if filed. If your credit card bills have not been turned over to a collection company, you can call the credit card company and ask them to stop charging interest and allow interest only payments. Some credit card companies will allow a single payment of less than the full amount due. Once your account is turned over to a collection company you’ll need to act before a lawsuit is filed. If you are being contacted by a debt collector or collection company, there is a federal law which guarantees you certain rights. Debt collectors can be aggressive in their collection efforts since they are generally paid based on how much you pay. When debt collectors violate your rights under federal law they may be subject to fines and penalties. If you have been served with a lawsuit, you have a limited time to respond. Without a timely response to a lawsuit you can have a judgment taken against you which could eventually result in a garnishment or lien on your property. If a judgment is taken, your pay can be garnished and property can be taken to satisfy the judgment. If a bankruptcy is right for you, the day the bankruptcy is filed, collections efforts including garnishment of your check stops. Although some credit card bill problems can be resolved without filing a bankruptcy, a bankruptcy is designed to help people get a fresh start with a chapter 7 bankruptcy or time to breathe in a chapter 13 bankruptcy which allows individuals to reorganize and catch up on their bills. Either bankruptcy can help with more than credit card bills. Call Law Office of Kenneth P. Carp today to discuss how to get debt relief from credit card bills. We are here to help you. Call our offices today at (636) 947-3600.